Many time tested remedies and natural health protocols have been passed down from generation to generation since the beginning of time. There are the Ayurvedic traditions from India and the many healing arts from Asia; in fact every culture has had their own natural formulas and healing customs. Most of us are familiar with acupuncture, essential oils, saunas, and massage, all of which come from the past yet play a very important role in the new health model of today. Today many health seekers are looking to the past, back to when our ancestors had a far more natural lifestyle and used natural remedies to remain incredibly healthy. This was a time when all food was organic, man-made pollution was virtually non-existent, and people lived much closer to the earth. When following a more natural way we put the body in a position to heal itself as nature intended. Quite often it is not as fast, but it is always more effective as the body has actually healed rather than merely having the symptoms treated. In this website and our newsletter Vibrant Living we will be addressing many forms of natural health so you’ll have a chance to learn about many of these modalities and see what might work best for you. One thing that is very appealing about many forms of natural health is that they are very inexpensive and require only perseverance on your part. That’s not to say that some protocols today are not a little spendy to say the least. Today modern technology has been blended with ancient wisdom very effectively to bring natural forms of healing to the forefront of our modern day lifestyle. Things like far infrared saunas, hyperbaric oxygen chambers, and magnetic mattress pads help untold numbers of people overcome challenges and stay healthy every day. You might say that these things are not natural and in the true sense they are not, but neither is the world we live in. Today the utilization of technology is very helpful in bringing health and healing to many who would otherwise be miserable or suffer worse. Of course on this site we feel a great nutritional foundation should be the beginning of any health seeker’s program. And when it comes to natural health and diet, we feel that man’s original diet fits the bill nicely. Yes that’s right, the raw food diet meets all of our nutritional and caloric needs as well as putting us in an optimal position for self healing and maintaining great health. You can learn more about the raw food diet here. 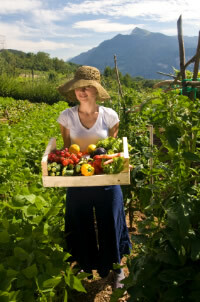 It’s quite clear that good health is comprised of much more than diet and a few natural protocols. That’s why our newsletter Vibrant Living will be covering topics like quality sleep, adequate sunshine and exercise, fresh air, pure water, the importance of community, loving relationships, and some type of spiritual connection, even if getting out in nature is your religion.